“We had a musical in the school, The Wizard of Oz. Three dogs played the part of Toto, and when they came onstage, the students’ faces just lit up. I started doing more research and realised that pets are being used in nursing homes across New Zealand, and in America they have courtroom assistance dogs. There are major health benefits to having these therapy pets,” the chaplain explains. 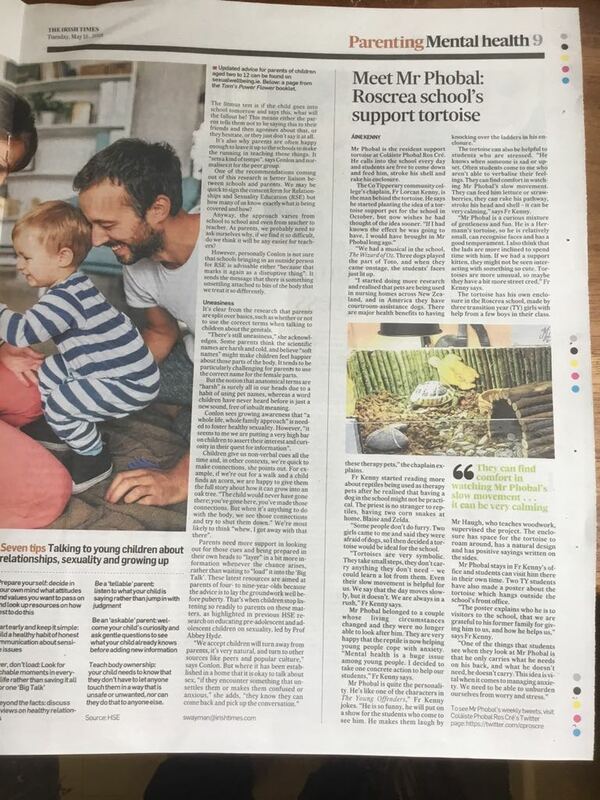 “Tortoises are very symbolic. They take small steps, they don’t carry anything they don’t need – we could learn a lot from them. Even their slow movement is helpful for us. We say that the day moves slowly, but it doesn’t. We are always in a rush,” Fr Kenny says. Mr Phobal belonged to a couple whose living circumstances changed and they were no longer able to look after him. They are very happy that the reptile is now helping young people cope with anxiety. “Mental health is a huge issue among young people. I decided to take one concrete action to help our students,” Fr Kenny says. 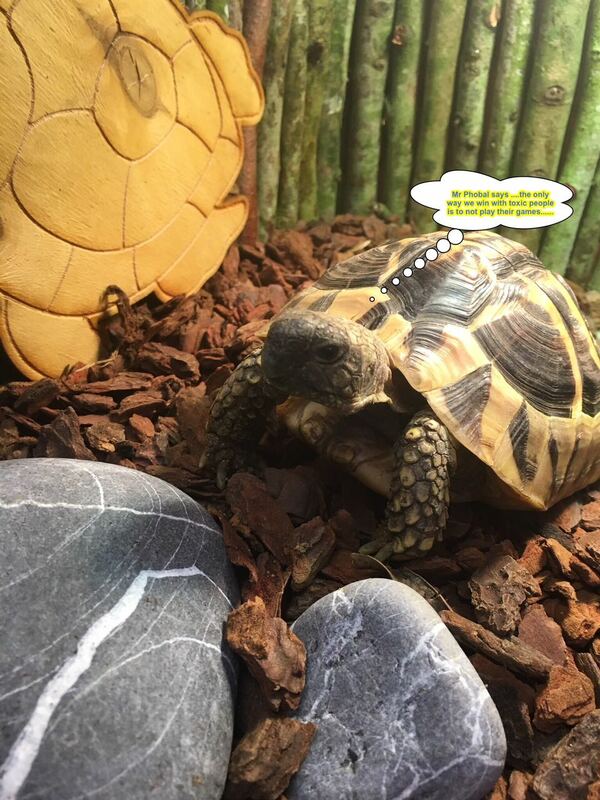 The tortoise can also be helpful to students who are stressed. “He knows when someone is sad or upset. Often students come to me who aren’t able to verbalise their feelings. They can find comfort in watching Mr Phobal’s slow movement. They can feed him lettuce or strawberries, they can rake his pathway, stroke his head and shell – it can be very calming,” says Fr Kenny. “Mr Phobal is a curious mixture of gentleness and fun. He is a Hermann’s tortoise, so he is relatively small, can recognise faces and has a good temperament. I also think that the lads are more inclined to spend time with him. If we had a support kitten, they might not be seen interacting with something so cute. Tortoises are more unusual, so maybe they have a bit more street cred,” Fr Kenny says. The tortoise has his own enclosure in the school, made by three Transition Year (TY) girls with help from a few boys in their class. Mr Haugh, who teaches woodwork, supervised the project. The enclosure has space for the tortoise to roam around, has a natural design and has positive sayings written on the sides. Mr Phobal stays in Fr Kenny’s office and students can visit him there in their own time. Two TY students have also made a poster about the tortoise which hangs outside the school’s front office. “The poster explains who he is to visitors to the school, that we are grateful to his former family for giving him to us, and how he helps us,” says Fr Kenny. To see Mr Phobal’s weekly tweets, visit Coláiste Phobal Ros Cré’s Twitter page: https://twitter.com/cproscre.